Discover this popular Portuguese Tour that will take you from the Monastery of Jeronimos and Lisbon 's downtown to Oporto wine cellars. It will enchant you as you travel from Serra da Estrela Mountains to the Algarve beaches. This Portuguese tour, a 12-day vacation, shows you all of Portugal without any rush thanks to the well-planned two-night stopovers in Lisbon, Oporto and the Algarve. 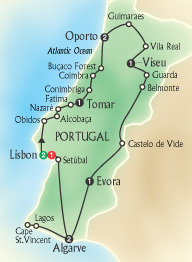 The full circle from Lisbon to Lisbon shows you the interior and almost the entire coastline of Portugal. Local guided sightseeing in Lisbon, Oporto and Evora includes Jeronimos Monastery, the Stock Exchange, the Arabian Hall, the Ossuary Chapel and many other must-see sights. Visits to Obidos, Fatima, a Port wine cellar, the Roman ruins of Conimbriga with its excellent museum, Villa Real and Belmonte are included as well. The 11 day Portugal Tour will also allow you to explore the Alentejo with by stopping in Evora, an historic and quaint town as well as Algarve and its coastline of beaches and Mourish architectural influence. Day 1 (Sun.) Board your overnight transatlantic flight. Day 2 Arrival in Lisbon , Portugal. (Mon.) Free time to rest or start exploring the Portuguese capital. At 6 p.m. meet your tour director and traveling companions and have a welcome dinner at your hotel. Day 3 Lisbon . (Tue.) Now the capital of a small country on the western fringe of the Iberian Peninsula, Lisbon was the center of Europe's longest-lived overseas empire. Portugal's imperial ambitions date back to Prince Henry the Navigator's 15th-century discoveries in West Africa and did not subside until the 1970s. History has left its marks on the city, in striking contrast with modern features. Morning sightseeing on the banks of the Tagus River includes two Manueline jewels: Belem Tower guarding the mouth of the Tagus and JERONIMOS MONASTERY with the tomb of Vasco da Gama. Drive past the Bull Ring to Pombal Statue and on along the grand Avenida da Liberdade. Then enjoy a walk through the cobbled alleys of quaint Alfama, the quarter of the seamen. Afternoon and evening at leisure; your tour director will propose an optional excursion to the royal palace of Sintra in the park-like area west of Lisbon, and tonight an optional dinner at a typical taverna with Fado-style entertainment. Day 4 Lisbon - Fatima - Tomar . (Wed.) First stop on your northbound journey is medieval Obidos. Go back in time as you pass the main gate in the impressive perimeter wall and walk along the narrow streets. Continue to Alcobaça to visit the church of SANTA MARIA MONASTERY, built in the 12th century for 999 Cistercian monks. See the elaborate tombs of King Pedro I and his Castilian lover Inês de Castro and hear how she was murdered at the order of Pedro's father. The fishing harbor of Nazaré is the perfect place for a leisurely lunch break. In the afternoon mix with the pilgrims at the country's hallowed national shrine, Fatima's BASILICA OF OUR LADY OF THE ROSARY. Overnight in Tomar, the historic seat of the mighty Order of the Knights of Christ. Day 5 Tomar - Oporto . (Thu.) On the way out of Tomar visit the hilltop CONVENT OF CHRIST with its famous Manueline window. Further north, the ROMAN RUINS OF CONIMBRIGA are eloquent testimony to centuries of Roman influence. Tour the excavations, view the well-preserved mosaics, and visit the excellent MUSEUM. On to Coimbra, strategically situated on a hill overlooking the Mondego River. After a visit to the gilded baroque LIBRARY of its 700-year-old university, drive through the ancient BUÇACO FOREST. Marvel at its luxurious variety of plants from various parts of the world, carefully protected for centuries. Day 6 Oporto . (Fri.) Morning sightseeing with a local guide in Portugal's second-largest city, the bustling capital of the north. After a panoramic drive to the mouth of the Douro River see the soaring cathedral, admire the richly decorated CHURCH OF SAO FRANCISCO, and visit the STOCK EXCHANGE with its contemporary ARABIAN HALL inspired by Granada's Alhambra. Before lunch there's time to visit a PORT WINE CELLAR where the famous wine produced from grapes of the Douro Valley is aged in huge vats. Afternoon at leisure, and tonight your tour director will suggest an optional dinner at one of Oporto's typical restaurants. Day 7 Oporto - Viseu . (Sat.) Having seen Portugal's prosperous urban life, today you'll catch glimpses of a different reality: a rural population living off tiny patches of land tended with traditional farming methods. Head inland to Guimaraes, often referred to as the "Cradle of Portugal" because of its association with the country's first king, Alfonso Henriques. Next you reach Vila Real, former capital of Portugal's northeastern region of Trás-os-Montes. Just outside town visit the splendid park and manor of PALACIO DE MATEUS, whose picture graces the label of the excellent Mateus rosé wine. From here a scenic road cuts right through the valley of the Douro River, which flows between terraced slopes where port wine grapes grow. Spend the night in Viseu, believed to have been the home of the Lusitanian leader Viriate who resisted the Roman conquest. Day 8 Viseu - Evora . (Sun.) The new fast road provides splendid views of mainland Portugal's highest mountain range, the Serra da Estrela. Pass Guarda, the country's highest city, and stop in Belmonte, birthplace of Pedro Alvares Cabral, the discoverer of Brazil. Today Belmonte is a symbol of Jewish awakening. Some of its inhabitants have reconverted to the belief of their ancestors who, during the dark days of the Inquisition, were forced to accept the Catholic religion. Cross the Tagus River, enter the Alentejo plain and look forward to an afternoon break in Castelo de Vide, an enchanting small town. Time to walk through the Jewish Quarter with its white-washed houses and take pictures of the 14th-century castle. Continue to Evora, the cultural center of southern Portugal and a former royal residence. Day 9 Evora - Algarve . (Mon.) A massive wall surrounds Evora's medieval center, classified as a World Heritage Site. A guided walking tour through its narrow alleys takes you to the Roman Temple, the early Gothic CATHEDRAL, Portas de Moura Fountain, and SAO FRANCISCO CHURCH. Visit the OSSUARY CHAPEL, whose walls are covered with thousands of human bones and skulls. After lunch proceed across the arid Alentejo plain to the Algarve, Portugal's most popular holiday area. Day 10 Algarve Excursion . (Tue.) Today you may prefer to relax, explore this beautiful resort at your own pace, or join the included excursion along the enchanting southern coastline. History comes alive as you reach the wind-swept PROMONTORY OF SAGRES, where Henry the Navigator lived and planned his overseas expansion. Only a few miles away is Cape St. Vincent, the southwestern corner of continental Europe, a dramatic cliff defying the waves of an ever-angry Atlantic Ocean. After a lunch break in pretty Lagos you return to your hotel with time left in the day to catch up on your postcards and shopping. Tonight is your chance to try one of the seafood restaurants for which the Algarve is famous. Your tour director knows the local scene. Day 11 Algarve - Lisbon . (Wed.) Head north to Setubal, a major port and industrial center on the north bank of the Sado Estuary. From here take the scenic route over the Serra da Arrábida and savor sweeping views of the Tróia Peninsula. Catch glimpses of the castle of Sesimbra, which recall fierce medieval battles between Christians and Moors. After crossing the Bridge of April 25th you're back in Lisbon for the last evening of an exciting touring adventure. Day 12 (Thu.) Your homebound flight arrives the same day.